Or do you think you’re stuck because you can’t afford to make changes? 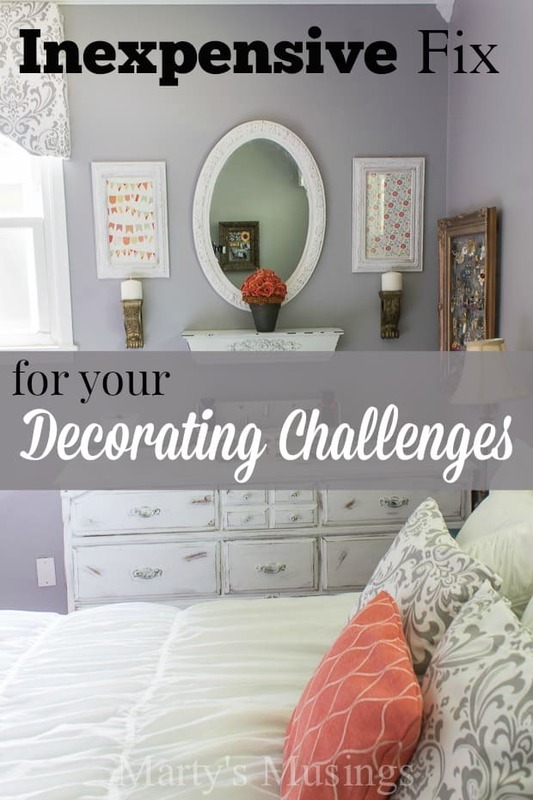 I want to encourage you to share an inexpensive fix for your decorating challenges! My weapon of choice? Paint! One of my favorite ways to change up my home decor is by the use of paint. Since my DIY husband is a painting contractor by trade he’s usually in charge of the actual process! However, on our master bedroom makeover I actually picked up a brush and went for it! I helped to paint all of our bedroom furniture, which was a task! You can see the whole room here and how I decorated it for practically nothing here. Paint is one of the least expensive ways to change things up. There are several ways this relatively inexpensive product can help you define and capitalize on your unique preferences. Sometimes you just need to try something new. After my oldest son went to college in 2011 I turned his room into a scrapbook/craft space that I absolutely love. Tim painted the walls a lovely neutral color that I became bored with three years later. I wanted my creative space to inspire me so I went bold and chose Perpetual Purple for an accent color. The room definitely has a statement wall now and I don’t regret my choice at all. And what if I had? We could have always painted over it and tried another color. 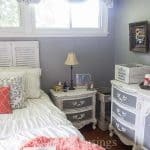 Paint coordinates furnishings and styles. Our living room walls are painted a subtle color, our sofas are a neutral color and most of the larger pieces of furniture are wood. 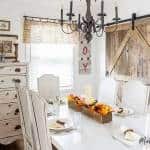 However, using a pop of a bright color with the pillows or painted accessories or artwork will help pull the room together and give it some life. These items are easy to swap out if you want to give your room a different feel between seasons as well. Bringing out brighter colors in the summer months and more muted tones during the winter will allow you to change without great expense. 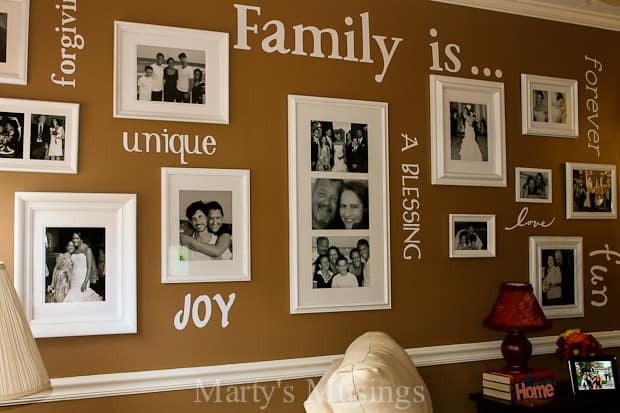 When I made our family gallery wall in the den I spray painted all the frames white and used black and white photos to unify the grouping. It is my favorite wall in our home. Paint sets a mood or style. My kitchen is a prime example of using paint to create a mood. 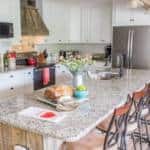 We have totally transformed the look of our kitchen and it began with an old dated china cabinet. My husband used Annie Sloan Chalk Paint (totally outside his comfort zone as a professional painter) in Old White and Provence to turn this into a conversation piece. After that we changed the color of the walls to this bright, sunshiny yellow which I absolutely adore. I then pulled the room together with fabric and accessories. Everything from the painted table to the shabby chic chairs were covered with a coat of paint. Even the DIY mason jar chandelier received some chalk paint, as did the kitchen buffet. 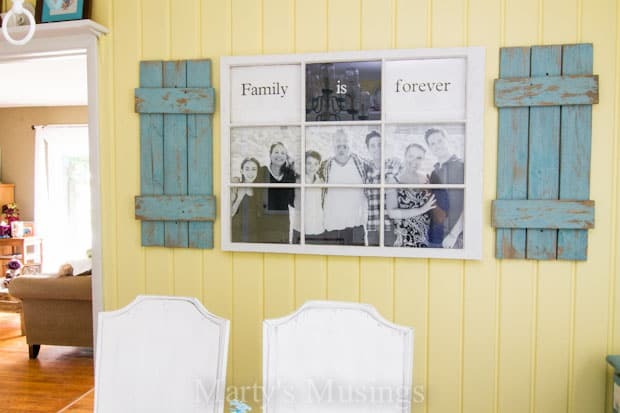 One of my favorite projects in this room is the old window photo frame. I took a family photo and had it printed as a black and white engineering print to fit the castoff window my husband found. 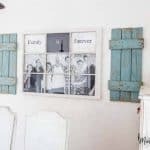 He took old fence boards and made the shutters and painted them. Paint allows for more frequent changes and updates. 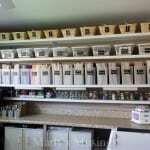 Some people get bored with their homes or want to try new styles, and paint is the option that is probably least expensive and easiest to redo if it doesn’t turn out the way you desire. Compared to remodeling or purchasing furniture, paint is a great alternative when you’re trying to discover your own personal style and taste. One of the biggest trends in home decor today is the use of chalkboard paint. Have you looked at Pinterest lately? These projects are everywhere! 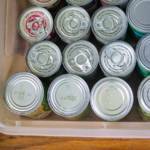 You can use spray paint or brush it on with products found at the local arts and crafts store. 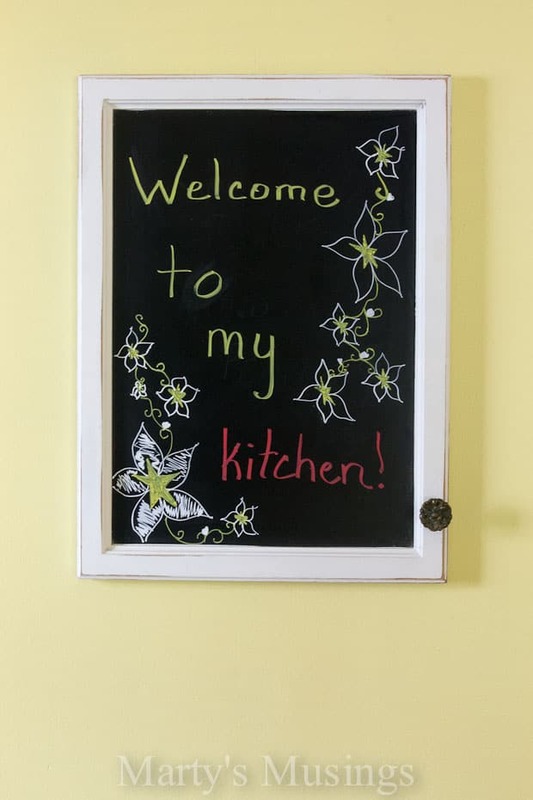 When we recently remodeled our small bathroom we took the old mirror from the medicine cabinet, sprayed it with chalkboard paint and now use it as a welcome and message board in the kitchen. I am no designer or trendsetter, just a woman who loves to see old treasures rediscovered with a little paint and imagination. 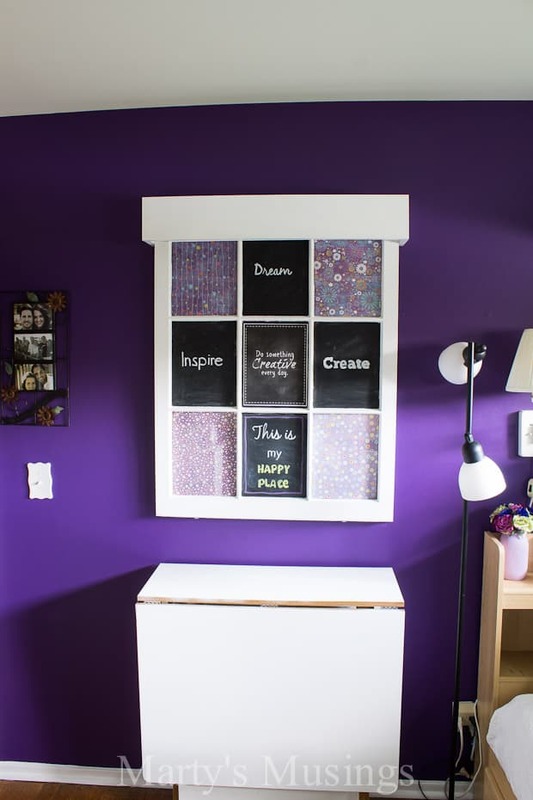 See any painting DIY projects in your future? Paint makes the biggest changes, especially to boring furniture. 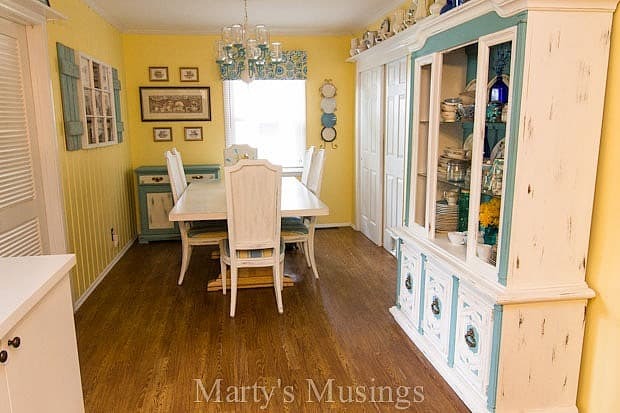 The kitchen/dining area is my favorite the colors are cheerful and sunny…..love. 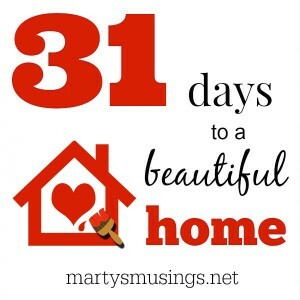 Your home is BEAUTIFUL! Paint does make such a difference but you have really good taste too! I really appreciate that, Deborah. I’ve never ever considered my house beautiful because I just didn’t have time to give attention to details. I love our home and am so grateful for the projects we’ve been able to do, but there are always more in the works!